I used to watch The Young Indiana Jones Chronicles back in the early 1990s when it aired, though I never remember actually enjoying it all that much. So now that it's on DVD, I figured why not give it another shot. Sometimes shows that are boring when your younger turn out to be deep and interesting when your older, just like sometimes shows you think are awesome as a kid turn out to be complete garbage when you try watching them as an adult. So, where does The Adventures of Young Indiana Jones - Volume One fall? I'd say somewhere in the middle. 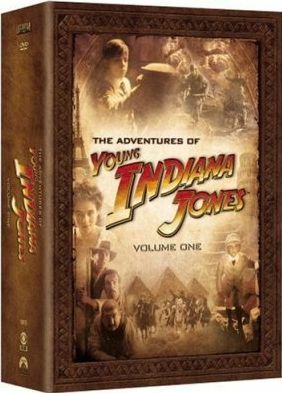 Oh, and yes, the DVD box set was renamed from The Young Indiana Jones Chronicles to The Adventures of Young Indiana Jones . The Adventures of Young Indiana Jones doesn't have a lot of action, and this is probably why it never grabbed me when I was younger. The shows spend a lot of time talking and interacting with figures of historical significance, and this is especially true of the episodes where Indy is 8-10 years old. When I think of Indiana Jones, I think of action and adventure. And really, who doesn't? Running from giant boulders, fighting on the wing of a NAZI airplane, escaping from an underground tunnel of fire, the movies definitely brought the action elements, so having a series without these action elements just makes it seem kind of dull. However, I also enjoyed it more due to the historical significance which I didn't care about when I was younger. Seeing all the famous people that he met and learning about what was going on in the world at the time was interesting. I'd say it'd make for a good way to teach some history in school, except that when I was a kid I thought the show was pretty boring and didn't really get the importance of the historical references. Another thing I really liked about the show was the actor they got to play Indy's father. He did a great job of portraying a younger version of the character that Sean Connery brought to life in the third film. I'm also kind of glad that they removed the bookends that were at the beginning and end of each episode. I never like those. Not at all. It's also some guy who looks like he has a ton of old man makeup on and then starts to reminisce about the good old days. But then, I'm sure purists of the show hated that these were removed, because they were part of the show. For the DVD set, I noticed that they put the episodes in chronological order, not in the order they aired. When they were on TV, the episodes would alternate each week between the 8-10 year old Indy (child-Indy) and the 16-20 year old Indy (teen-Indy). They provided a better balance, since the teen-Indy episodes had more action. Watching all of the child-Indy episodes together in a row got to be almost like a chore, as there was so little action going on and so much talking. It's easy to see why teen-Indy took over the series. Oh, and a side effect of this re-ordering was an odd transition between the episodes. For instance, originally child-Indy had and Egyptian adventure and at the end, the bad buy was caught but he hid the treasure he stole and wouldn't reveal it's location. And the BAM we're on to the next county. Originally, the story continued with teen-Indy coming across that man in Mexico and finally getting back the treasure that they guy stole. That story flows nicely. The other way feels like they just gave up on the story and moved on. Another weird thing I noticed while watching this series is the child actor. His appearance would occassionaly change drastically, and then revert back. I figured they were probably using twins who weren't identical, but apparently there was only one, a kid named Corey Carrier. So then why does he look different in some scenes. He goes from having a gap between his front teeth to having no gap, and his hair goes from blonde to brown, and then he looks a few years older while apparently still staying the same height. It's just freaky. And I had to find out what was going on, so I turned to the Internet. Apparently they went back a few years later and filmed some additional scenes, and then digitally altered him so his height would match. So, mystery solved! The box set comes with a TON of discs, some of which are just the special features for the previous disc (which would have contained two episodes). I have not yet gotten a chance to watch all the extra features, but I am interested to see what they're all about. They actually filmed on location for a lot of these episodes, and the episodes take place all around the world so it'd be interesting to learn more about that. You can tell that sometimes they spliced in some scenery/nature footage that wasn't filmed by them as it was more grainy and just didn't match the feel of the show, but that can be easily forgiven as they were on a TV show budget after all.